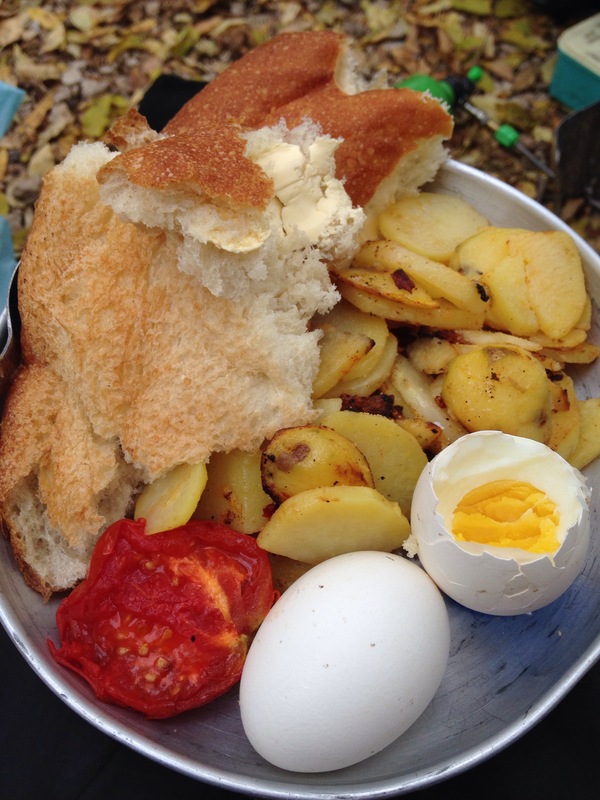 If Yerevan was the only place you visited in Armenia you would find it hard to believe that 30% of the Armenian population still live in poverty. Although the city was peaceful when we were there it has acted as the stage for a lot of recent civil unrest. Mass protests and marches broke out in the city in 2014 and 2015, demanding an end to corruption. Anger at the divide between the top 1% against the rest of the country also plays a big part in the protests as does the government’s current dependance on Russia despite the hypocrisy that Russia also sells arms to Azerbaijan. The most recent protests in July were disbanded by the government using tear gas and evidence of excessive force, journalist arrests and detention beatings have caused widespread criticism and distrust towards the police. In retaliation a small band of armed protesters who call themselves the Daredevils of Sassoun (after the Armenian heroic epic poem of the same name) stormed a police station and took a number of hostages on 17th July. Three policemen were killed in the crossfire and the standoff lasted two weeks. Despite the deaths, support for the Sassoun Daredevils remains strong, particularly among young activists who are disenfranchised by the governments failure to listen to their earlier peaceful protests in the summers of 2014 and 2015. The prime minister recently stepped down paving the way for his cabinet to also disband so the deed certainly created a shock in the political system. Only time will tell to see if the current president Sarkisyan can appoint a new cabinet which can muster popular support. 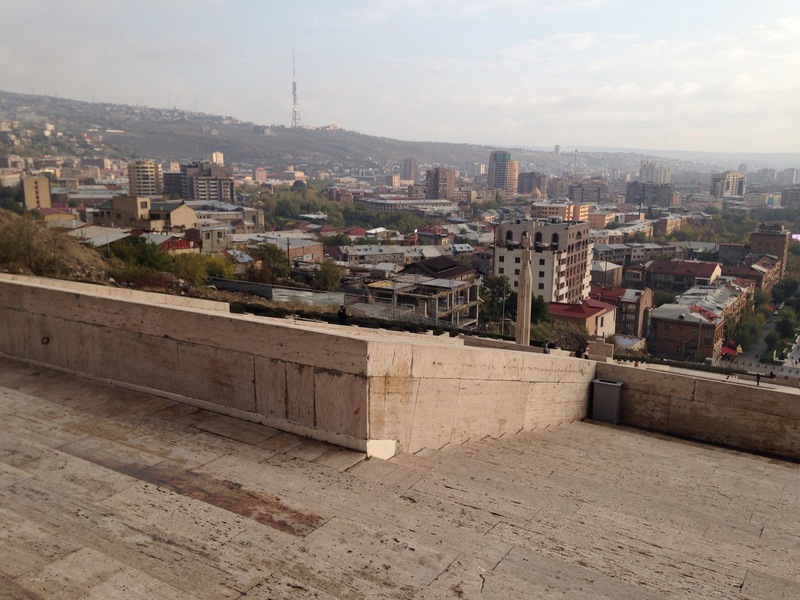 On the face of it Yerevan appears to be a thriving modern metropolis which spans across a collection of green hills, the Hrazdan river running through the centre via a deep gorge. The city has a very lively arts and culture scene and everywhere you look there are trendy shops, cafes, restaurants and basement bars. The first thing we did on arrival was to compile a list of music venues and make a visit to the opera house which sits in the centre of the city. 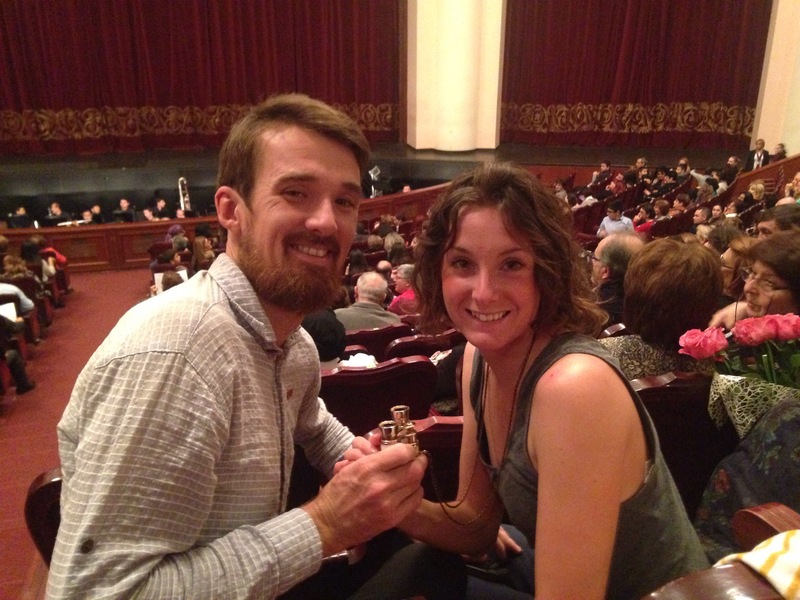 A production of Tosca was scheduled for Saturday evening and thanks to the low price of the tickets we were able to get top stall seats for only £16 each. We were both looking forward to spending some time in a city. Our couch surfing host fell through but we managed to find a hostel where we could cook cheap dinners and meet other travellers. We spent two really nice evenings with Jelena who was from Serbia but now lives in Moscow. We also visited the Cascade, a very cool 1980s building which acts both as a public outdoor garden and an interior art exhibition space. Its built into the bank of one of the city’s hills creating a giant stairway on the exterior and collection of art galleries within. It’s possible to climb up the full length of the front of the building via its many white, stone steps and pleasant sculpture courtyards provide nice places to catch your breath and enjoy the views across the city. Alternatively you can take the 8 floor escalator inside. We also visited the museum of the Armenian surrealist film maker Sergei Parajanov who’s unusual cinematography and controversial lifestyle meant he was arrested and imprisoned by the Soviet authorities. He spent nearly five years in a work camp in the late 1970s. Later he moved and later died in Yerevan. 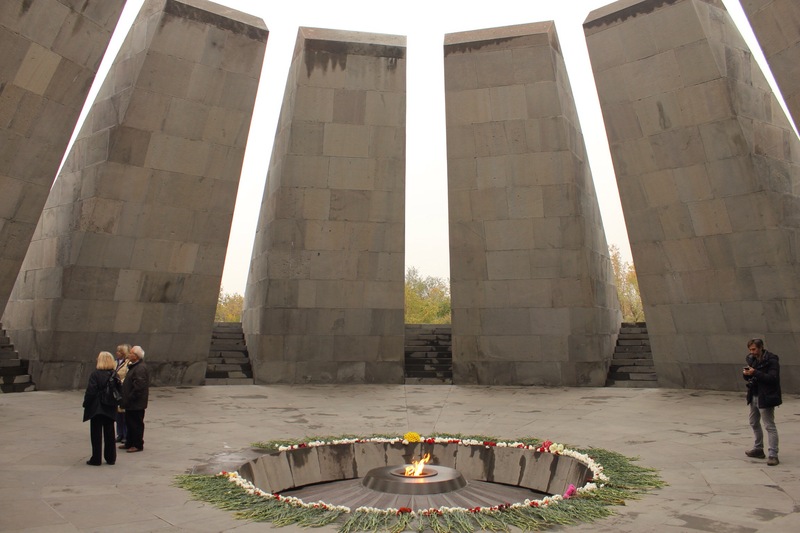 The highlight and most poignant visit was our afternoon in the Armenian genocide museum. 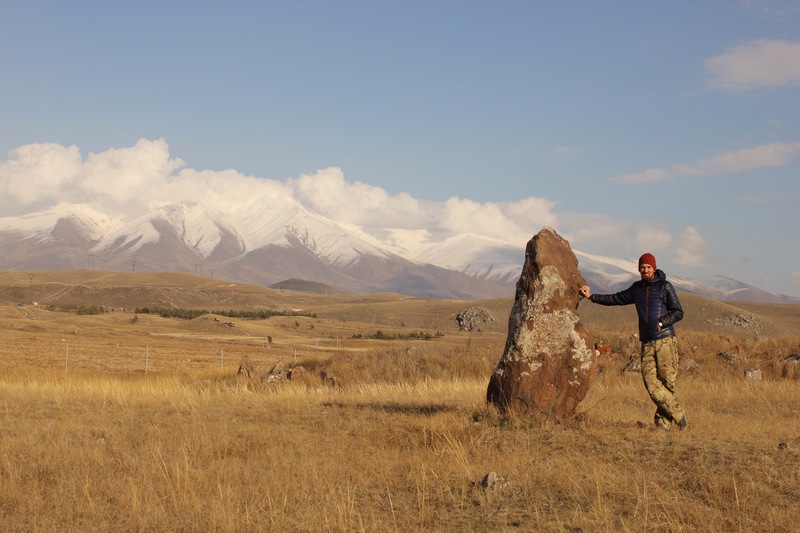 Ancient Armenia was once much bigger than the current Armenian region and by the 1600s a large section of western Armenia had come under Ottoman rule. The large Armenian population living in these provinces have a very sad and long history of suffering which climaxed in 1.5 million Christian Armenians being systematically killed between 1910-23. The genocide officially started in the early 20th century, (1915) with the round up of many prominent Armenian intellectuals. Later it moved onto the slaughter and forced army conscripts of all able bodied men and ended with the mass deportation and murder of hundreds of thousands of women and children. Many other children were taken away from their families and converted to Islam. To date only 29 countries have officially recognised the mass killings as genocide and Turkey continues to deny the word genocide as an accurate term. The museum is excellent but harrowing. We also visited the state museum which had a brilliant exhibition documenting Armenian history from as early as 4500BC through the Middle Bronze period, Uratrian kingdom, Persian and Roman conquests all the way up to 400 AD when the region adopted Christianity. After these culturally gluttonous days it was time to head over into Georgia. 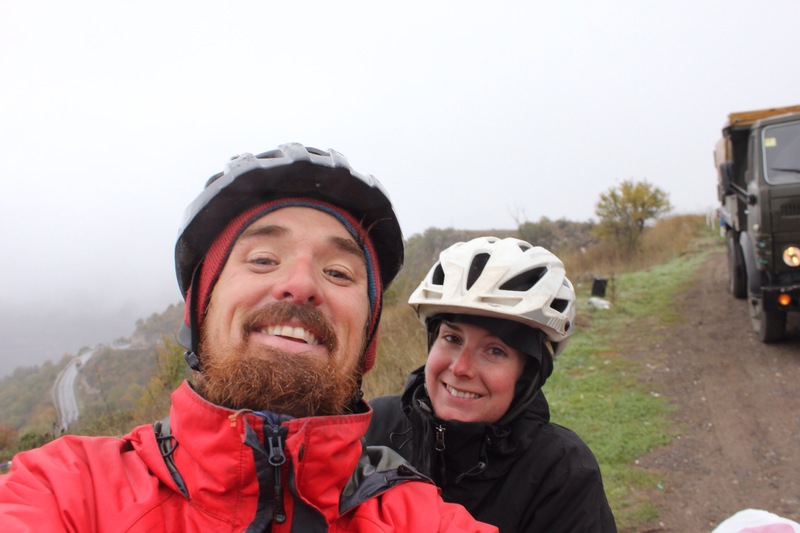 We would really have liked to cycled the full length of Armenia but the weather promised more rain and cold temperatures and in the end we decided to take a shared taxi across the border. It’s gloomy taking public transport when you have time to cycle instead but we definitely made the right decision. 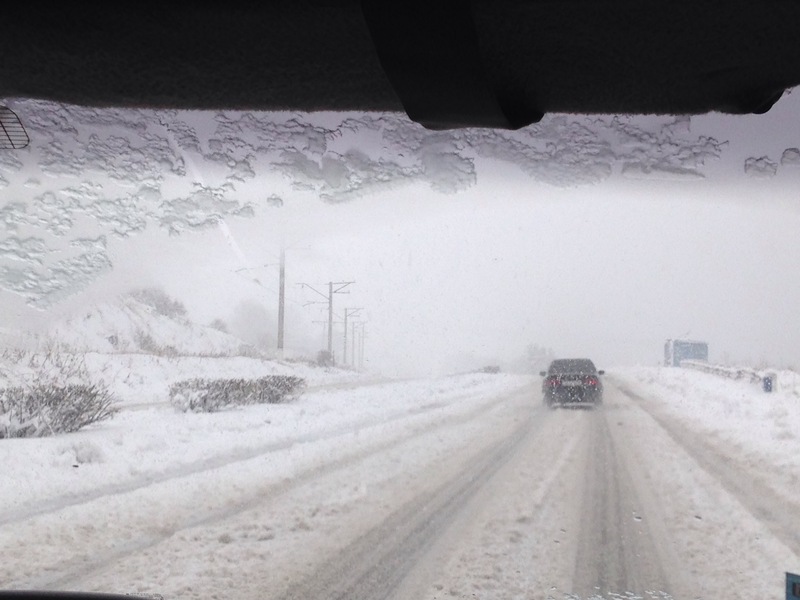 As soon as we left the city the rain we had had in the centre soon turned to thick snow and as we drove over the mountains towards the border via Lake Sevan the road got very very treacherous and there was a lot of waiting for trucks stuck in the drifts. Very suddenly we were leaving Armenia and crossing into Georgia, heading to the capital Tbilisi. And so concluded our trip through country number 11! 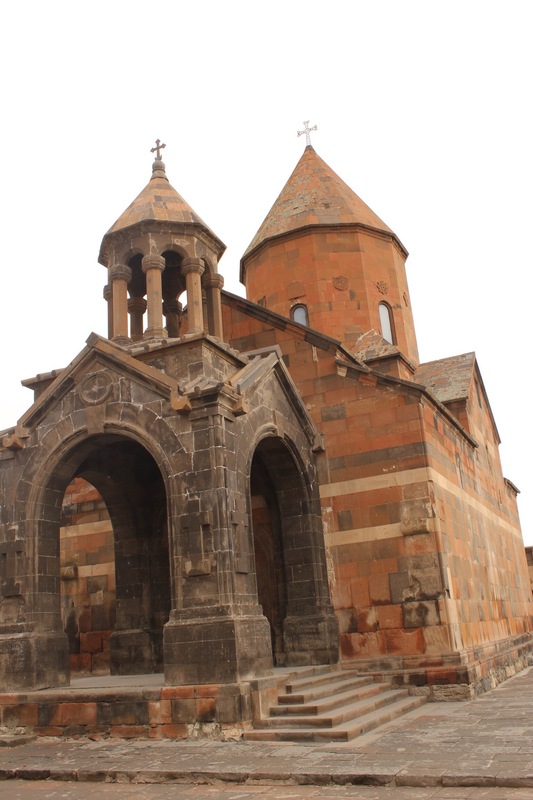 Armenia was the first nation to adopt Christianity in the early 4th century and so it’s Apostolic Church is the oldest Christian community on earth. It claims that the two Apostles Bartholemew and Thaddeus were its founders. 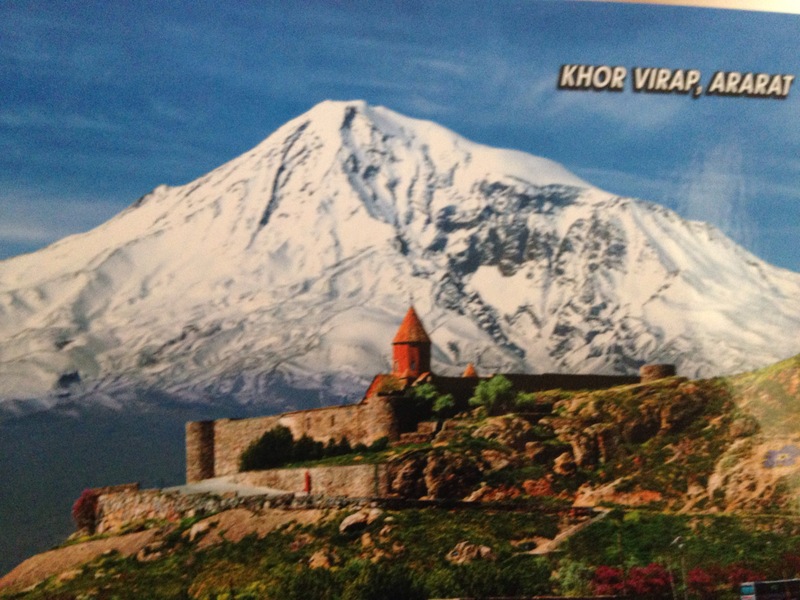 As Noah’s Ark is said to have landed on mount Ararat (now in Turkey but was once part of the ancient kingdom of Armenia) Armenians also claim they are direct descendants from Japheth, one of Noah’s grandsons. Consequently there are many ancient orthodox churches, monasteries and cathedrals across the country. 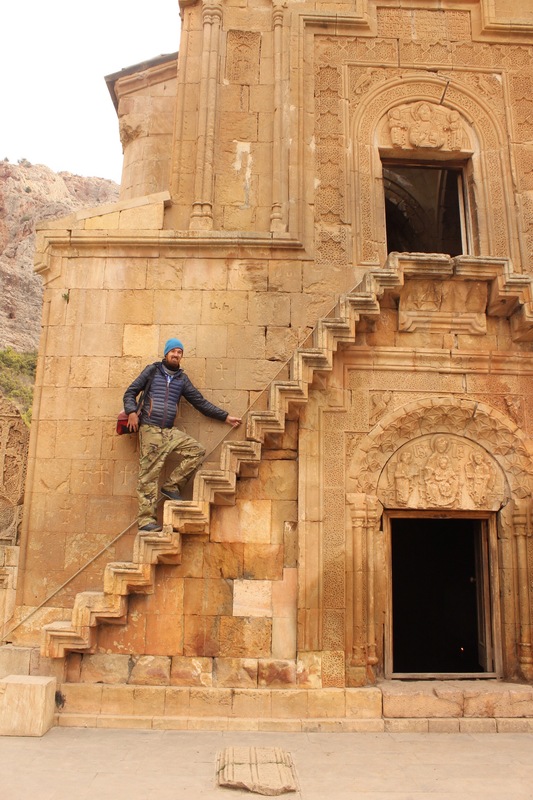 Noravank monastery was funded by the Orbelian dynasty who were an important noble family who ruled over Armenia’s southern most province Syunik. 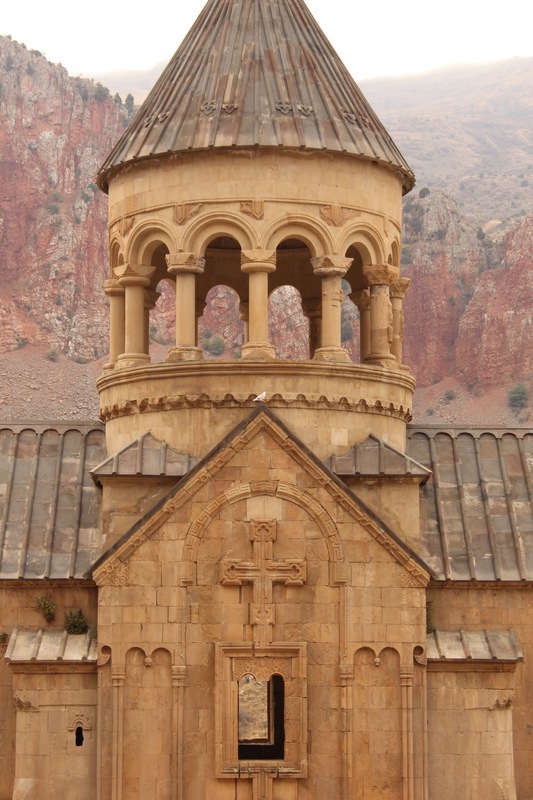 There are two structures, the Surb Astvatsatsin (Holy Mother of God) and the smaller Surb Karapet. The larger structure was designed and built by the famous architect, sculptor and painter Momik in 1339. 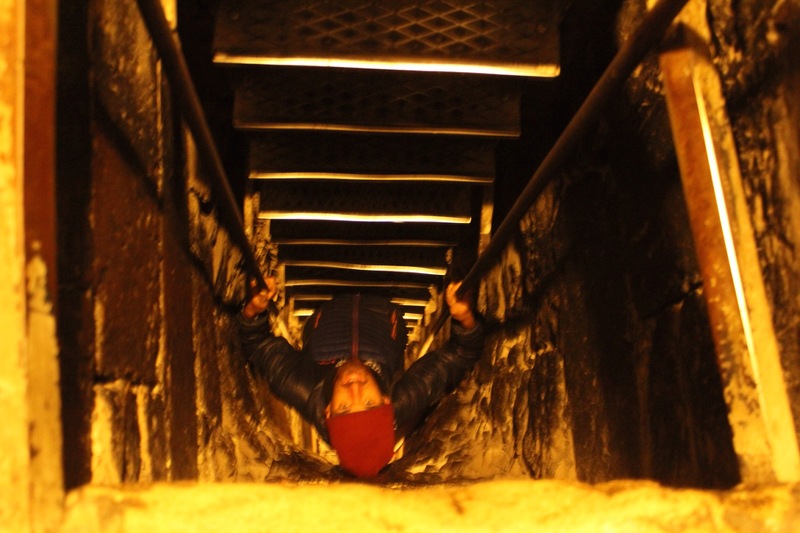 Some very narrow steps lead up to the upper done level which is supported by carved pillars. We were lucky enough to see a mass in progress while we were there. The ceremony was characterised with two priest dressed in rich blue embroidered robes and pointed hat and two women lay readers who were also dressed in blue. Women cover their heads with a scarf during church services. There was lots of incense and harmonised chanting. We both enjoyed walking around, after the countless temples and mosques there was something strangely familiar about all the symbology and architecture!! The weather cleared and we had another warm sunny day. We were heading towards another important religious site, Khor Virap. We turned off the main road as the bad weather started to roll in Again. Fortunately we found this empty store house 5km from the church so we set up camp inside and escaped the overnight downpours. As the story goes, Gregory (a Christian missionary) was imprisoned by the Armenian King Tiridates III. Tiridates threw Gregory into the jail of the Ancient city of Artashat and for many years he was assumed to have perished in the pit. However, an old devout woman kept Gregory alive by lowering provisions down to him. Meanwhile Tiridates continued his persecution of Christians across his realm; in the end these acts were said to have made him go mad. In a dream, God appears to Tiridates’ sister and tells her to release Gregory for he has the power to cure the King of his madness. Gregory is discovered and released, cures the King who then converts to Christianity and declares Armenia the first Christian state. The end! 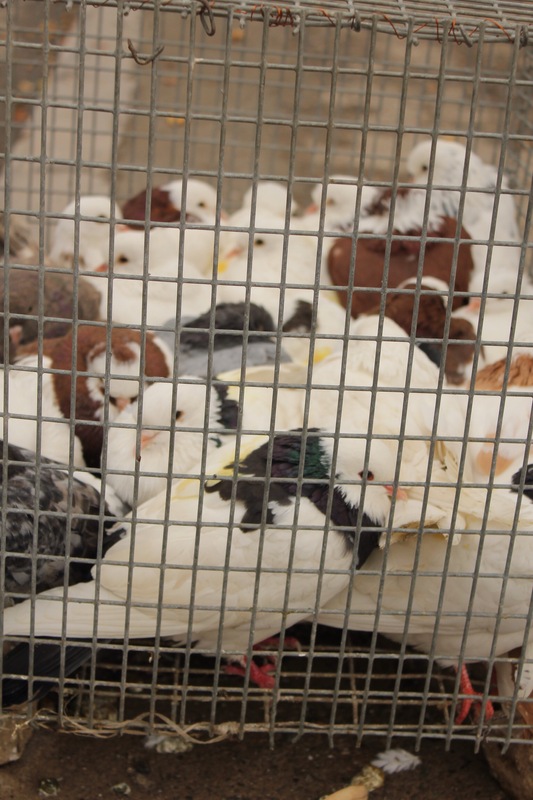 White doves kept at the entrance. Pilgrims believe they can be released and they will fly to the site where the ark landed on mount Ararat. 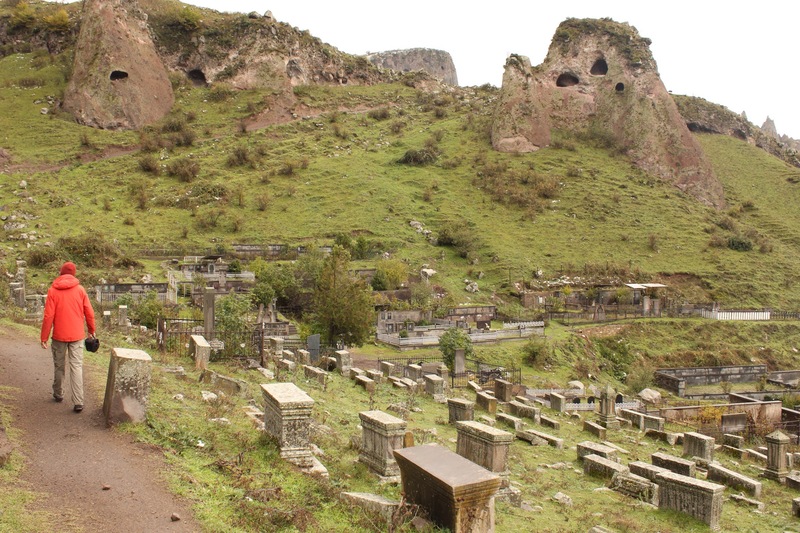 We both enjoyed our rest in Goris. 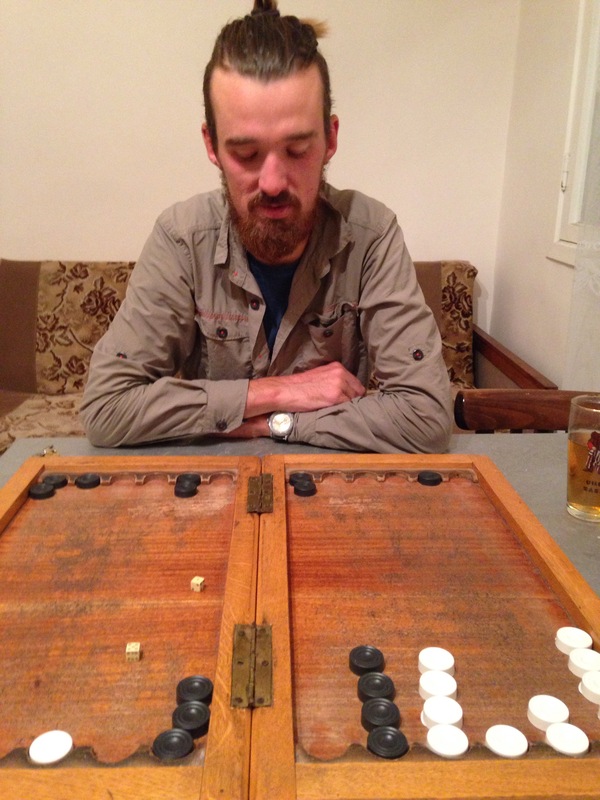 We found a cheapish hotel where we were the only guests and so we spent two cosy evenings cooking beef stew, playing backgammon and watching films in the living room. The snow which had fallen the first night gave the town a distinctly Christmassy feel to it and we both felt pretty festive while walking around the local food shops and markets. 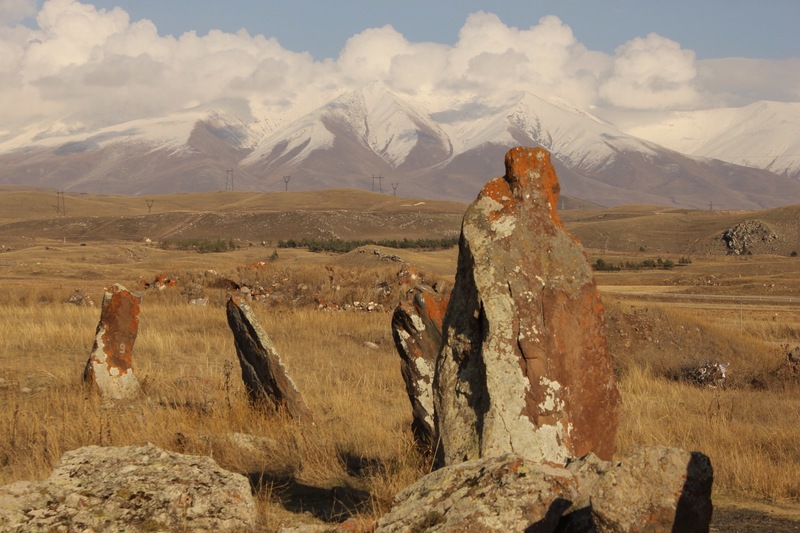 Surrounding Goris are some pretty cool pyramid shaped volcanic rocks which have been home to troglodyte dwellings and shelters for centuries. Fortunately the rain and snow abated enough the second afternoon for us to venture out and so we headed to the cemetery which sits amongst these strange cone shaped formations. 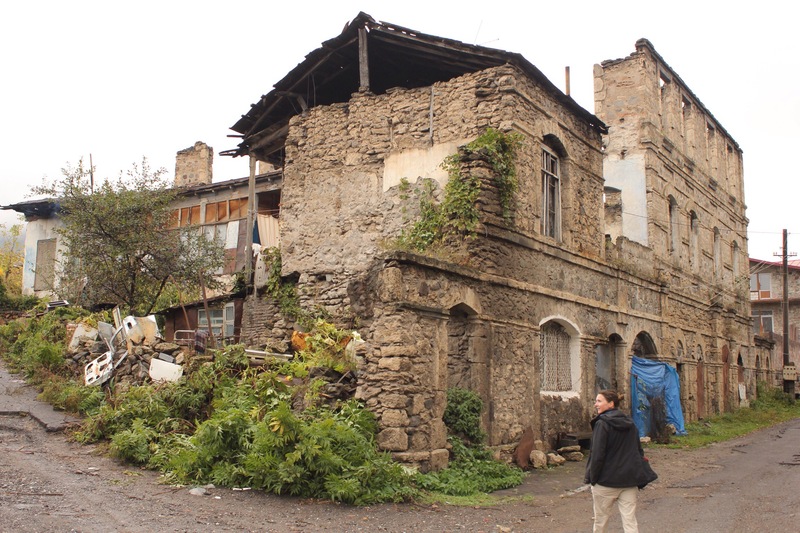 Goris old town has that feeling of a once affluent regional centre now gone slightly to seed. There are some beautiful old stone buildings adorned with wooden balconies but the majority of them are now pretty dilapidated and sorry looking. Still it was nice to get out and about and meet some of the townspeople. Winter preparations outside one house! The next day we got ready to cycle northwards again. 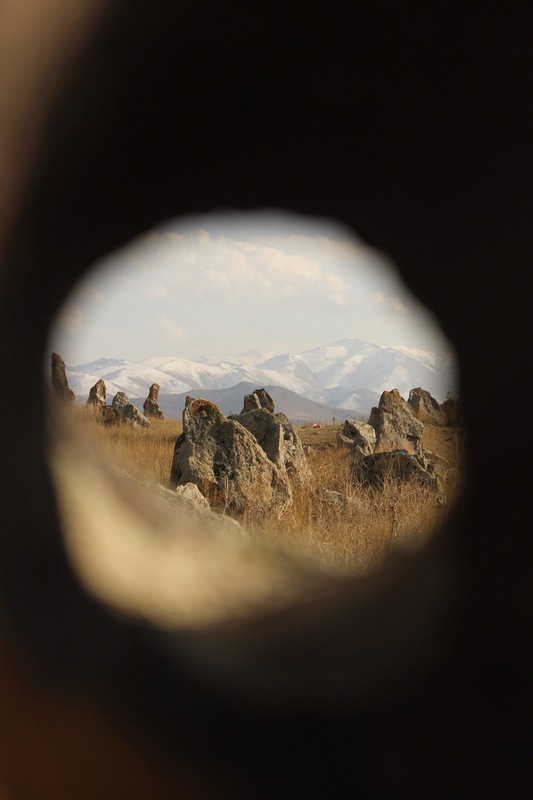 We were aiming for Zorats Karer, a pre-historic Bronze Age stone circle site. It was VERY foggy and we had to strap the torch light to the back of my helmet so cars could see us better. 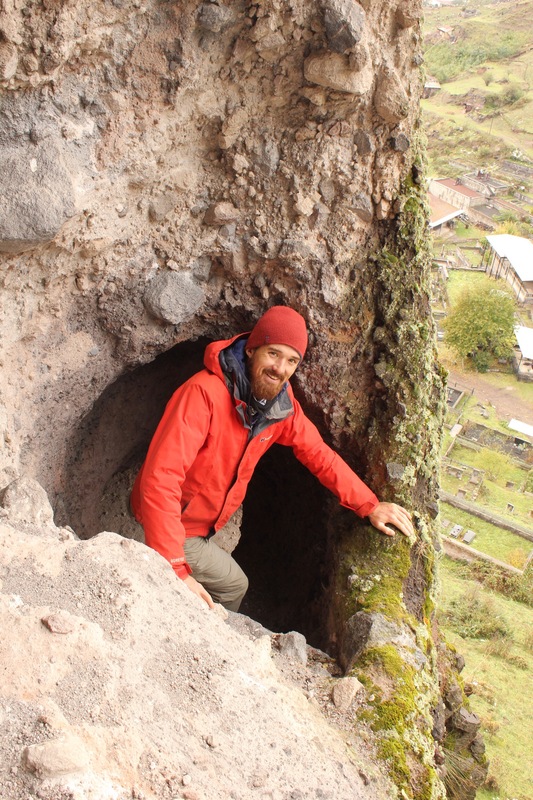 ﻿We climbed for a good few hours and then dropped down to the archaeological site where fortunately the weather was much clearer and warmer. It was nice exploring the site which is made up of 223 Menhirs (standing stones) with an excavated tomb in the middle. 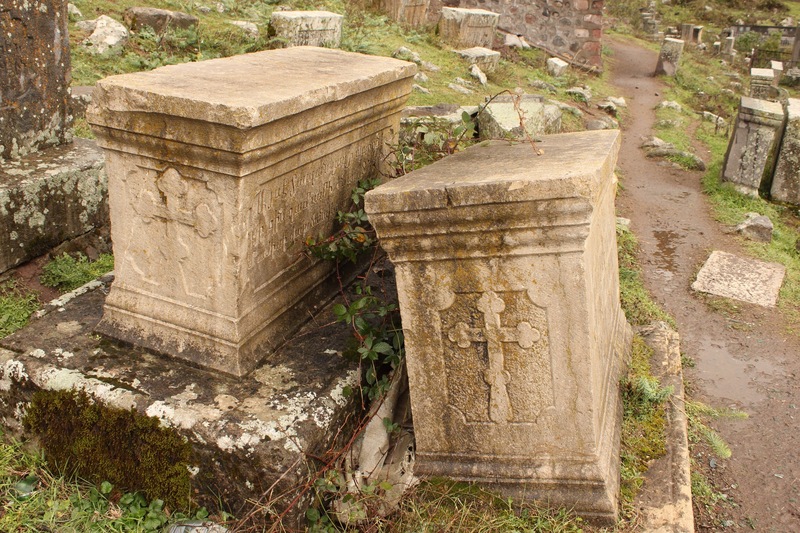 Many of the stones have carved holes cut into them. 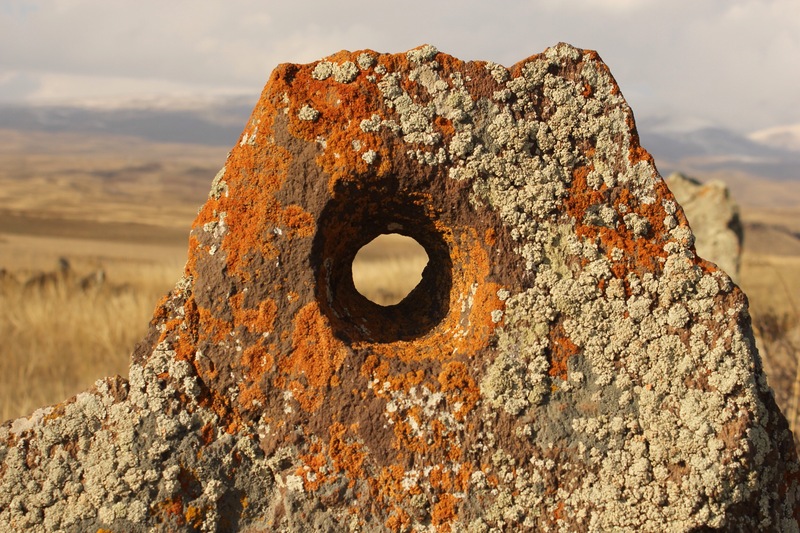 Many believe he holes were used for astronomical observation and calendar keeping purposes. The mist descended again that night but we kept warm by lighting another camp fire. The next day we had more climbing to do. The day was characterised by heavy mist and bleak landscapes. The view got slightly better when we reached the Spandarian reservoir where we managed to get half an hour of ‘sunshine’ during lunch. Luckily we were able to dry out the tent and take shelter behind a hill from the wind. Thankfully we had the wind behind us all day so didn’t feel it much when we were riding along. We reached the top at around 4:15pm and just as reached the summit two cycle tourers came up the hill from the other direction. Good timing. 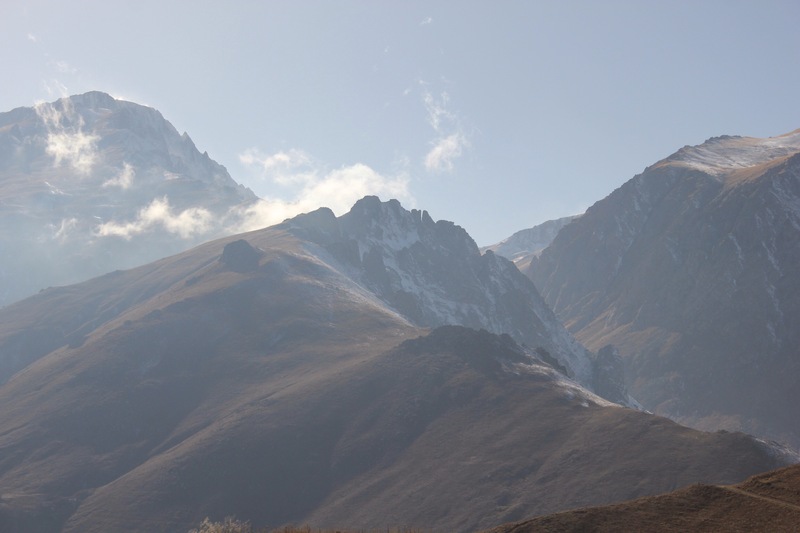 We didn’t stay long to chat because it was freezing but we were very cheered by the news that it was blue skies and late afternoon sunshine on the other side of the mountain. From here we had a big drop down towards warmer weather! Hurray! 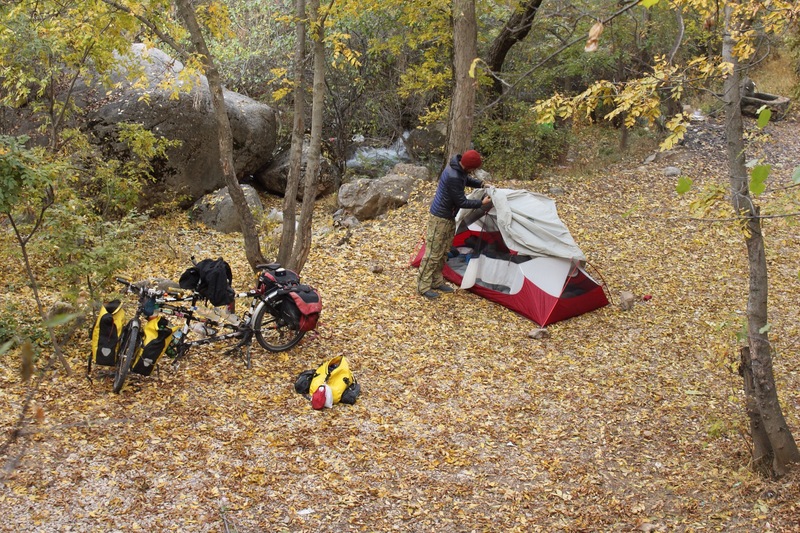 We dropped down a good 15km enjoying the views and sunshine and then pulled tandem off the road down to a great riverside camping spot. A tree had been recently felled so there was loads of dry wood about. Perfect! 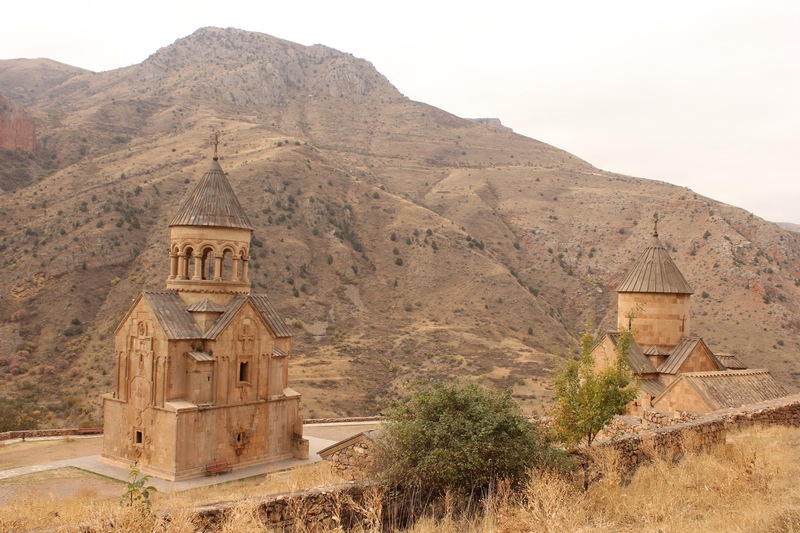 Armenia is known for its collection of impressive churches, monasteries and cathedrals. 13th century Nora-Vank church and monastery is one of the most famous and its 120km south from Yerevan so we made it our next stop. We enjoyed our first proper warm day with blue skies, and the last 10km up to the church were through an amazing gorge and although it was a really hard 2hour climb we both enjoyed the scenery and the sunshine. On the way up we were passed out by two wedding convoys who beeped and waved from their cars. Many of the vehicles had dead animal skins stuck to the bonnet and a guy waved a dead chicken from his car window as he passed. After reading up, we assumed that they were on their way to perform a Madagh blessing ceremony in front of the church; a chicken or other animal is slaughtered before eating it as part of a ceremonial feast. The practice is widespread in Armenia and is a tradition taken from their pagan past rather than Christianity. 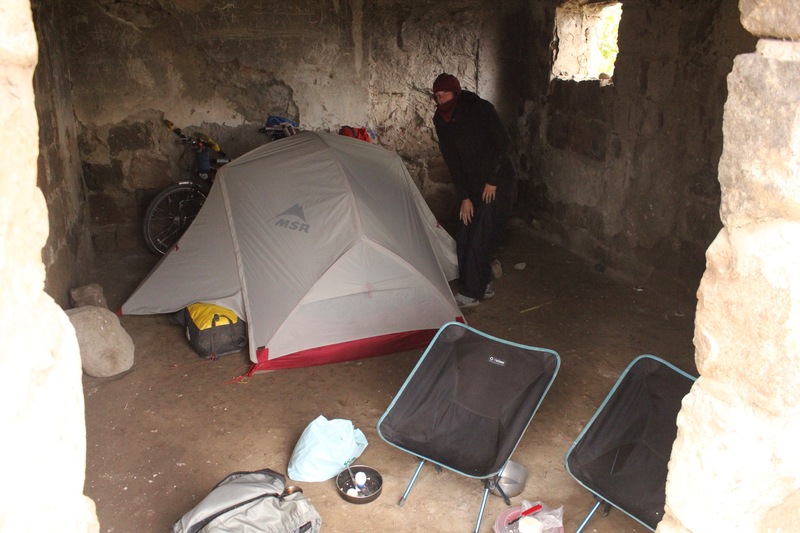 At the bottom of the church, which is perched on a high cliff surrounded by red brick cliffs, is a great wooded picnic area so we set up camp there with a plan to visit the complex the next morning. Naturally we had another camp fire! The next morning after an epic breakfast which Chaz Meades would have been proud of 😉 we cycled the bike up to the monastery. Our first week in Armenia didn’t get off to the best of starts. 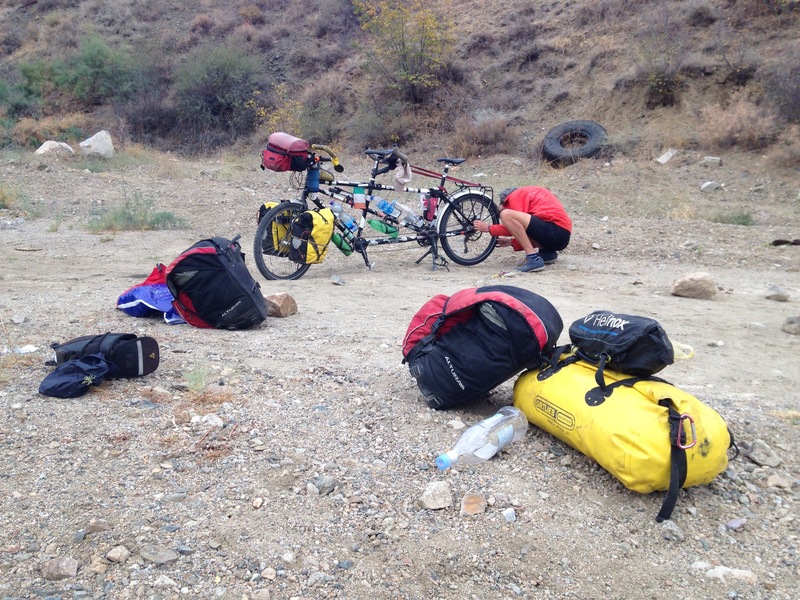 Our inner tube situation was getting desperate and despite another afternoon spent in ‘operation puncture repair’ we were uneasy about cycling 20km let alone the 320km we had to complete before reaching Yerevan – the next place we were likely to find some decent replacements. Armenia couldn’t feel more different to Iran, it’s amazing how much a few metres across a bridge makes! We were back in ex-soviet territory here and the people, architecture, fashion and food all feels very Slavic, a similar feeling to Bishkek and Dushanbe. What’s more, this was our first Christian country of the trip and it was really strange to see churches and crosses after 10 months of temples, stupas, Buddhas and mosques! Brexit and the drop in the pound is hitting us hard in terms of spending and we soon discover that even the cheapest hotel room in Armenia can quickly eat away a large part of our £20 daily budget. Food isn’t really cheap either and there isn’t the culture here of inviting travellers back to your home like there is in Iran. 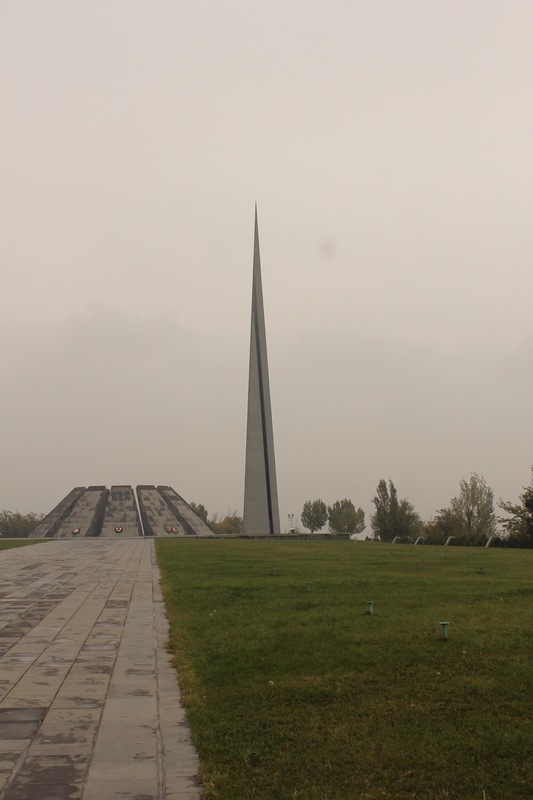 Warm showers host are non existent outside the capital Yerevan and even there they are thin on the ground. Europe is going to be similar if not worse so we need to try and get used to this and find ways of cutting costs where we can. 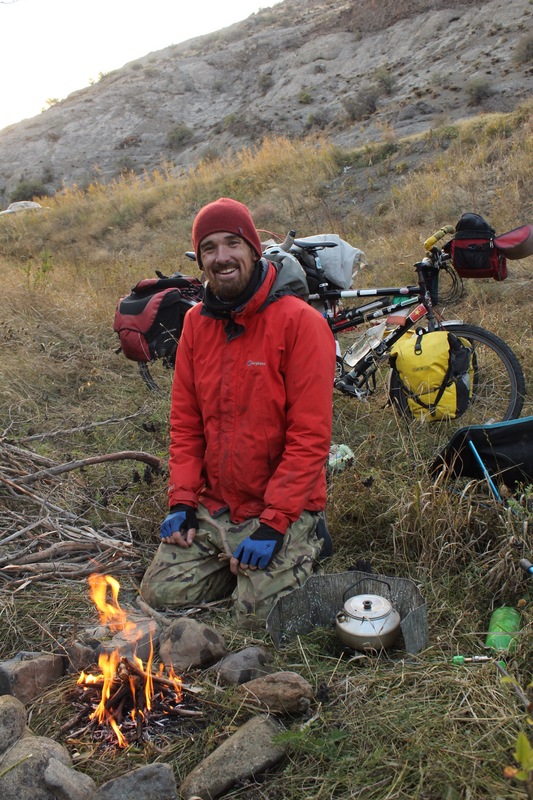 Camping is the obvious way of doing this but we were well into Autumn now and had some high mountain ranges to climb so we’d have to see how we got on with the weather. 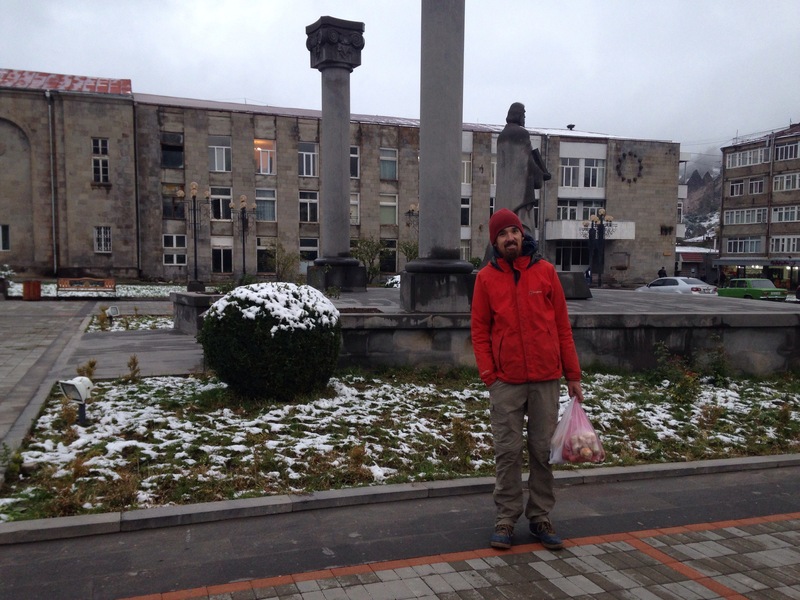 We spent a well needed rest day in the border town of Meghri. It was good to sleep in a bed and get on reliable wifi. In the afternoon our hotel owner and some friends had a mini party in the lobby and we are encouraged to join in. 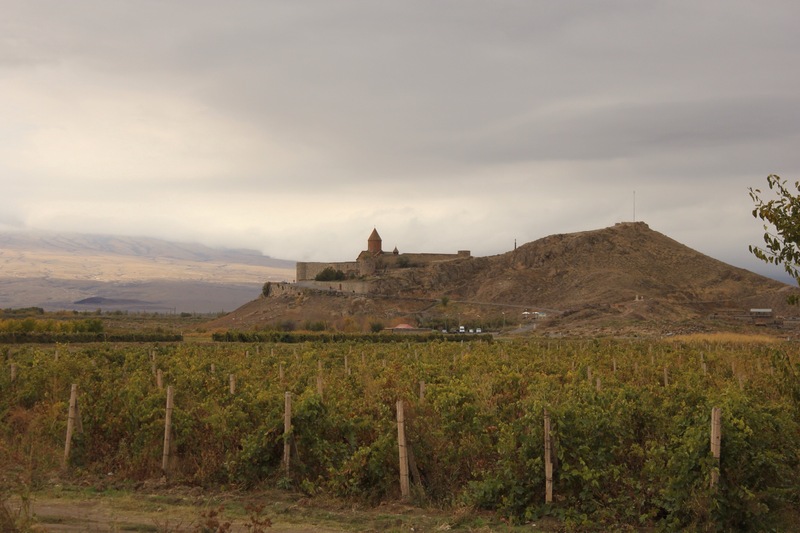 We sampled Armenian wine and champagne and a few beers. 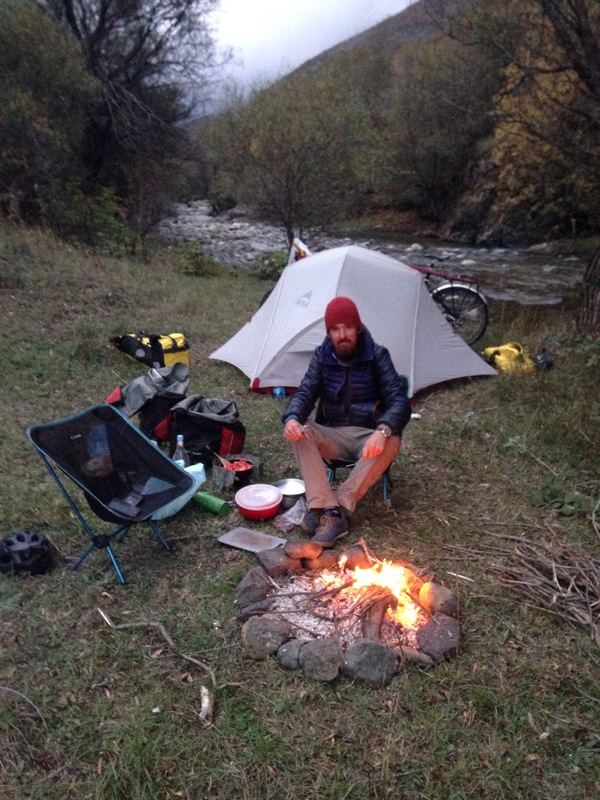 Just after dark Silvan from Paris arrives having also just crossed the border on his bike. He is here on a three week tour and started in Turkey. Paddy isn’t feeling the best and so goes to bed early but Silvan and I share dinner together and I soon discover he is a real opera buff so we have plenty to chat about. The next day we spent stocking up on food and soon discover there was nowhere in the town which could sell us diesel. In the end we ended up hailing down a truck and asking if we could siphon some off from their tank. 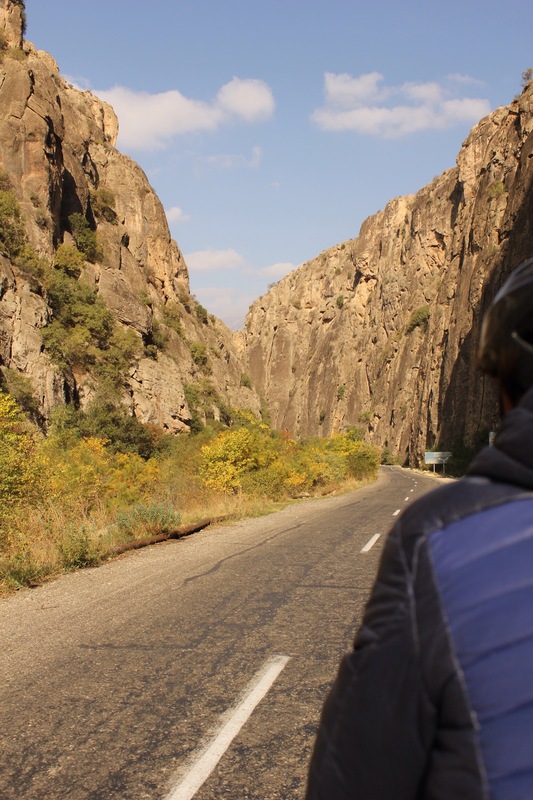 There are two routes to Goris and our plan was to cycle the eastern road which we had heard was very beautiful and would take us through a nature reserve. We were just praying that the puncture patches would hold. The road would see us cycle back down along the Aras river. 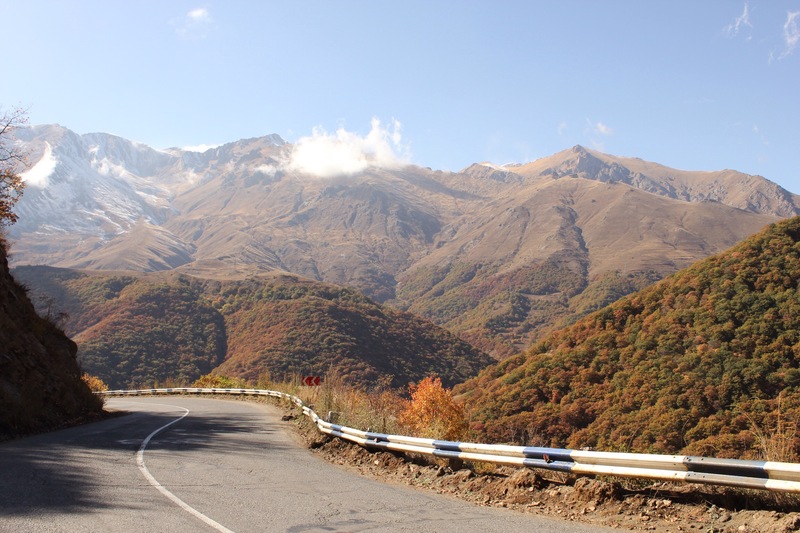 We had seen this patch of road from the Iranian side so it sort of felt we were going back on ourselves before the road started climbing up over the mountain range. 7km in we got a puncture… In hindsight we should have turned back at this point and come up with a plan b for the back wheel but we needed to camp that night to save on cash anyway so we changed the tire and kept going. At least the sun was shining! Another 10km in the second tube collapsed and we were forced to stop again. Feeling frustrated and anxious about what we were going to do tomorrow we set up camp. To top it off, half way though erecting the tent we both noticed a weird smell on the air and soon discovered that we’d chosen a spot 5 metres away from a rotting cow carcass… Lovely! So we had to pack up and move ourselves 300m up the road. The next day was dry but cloudy and there was a distinct chill in the air. 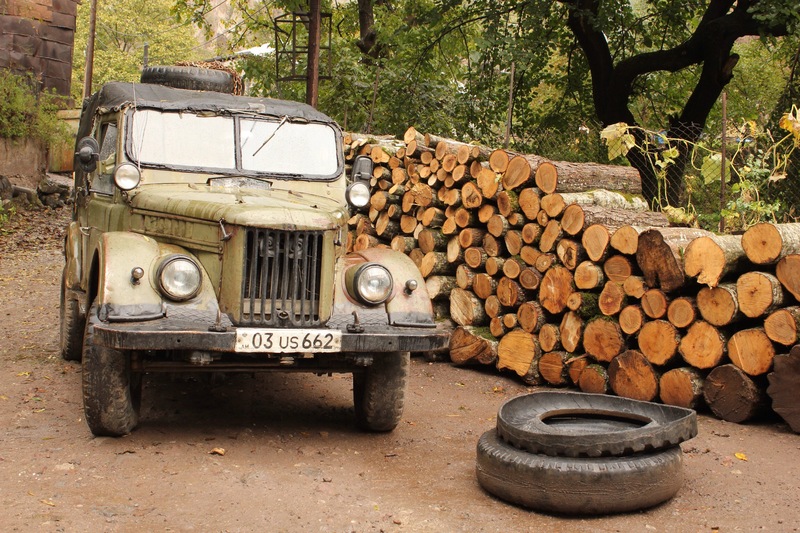 We had decided that we had no choice but to head back down to Meghri and see if a garage could fix the punctures well enough to get us to Yerevan. If not we would have to try and hitch the whole way, something we really didn’t want to do!! We managed to get back only by stopping every 4km to pump up the tube! On the way up to the town I spotted two people amongst some trees off the road side and they had bikes!! 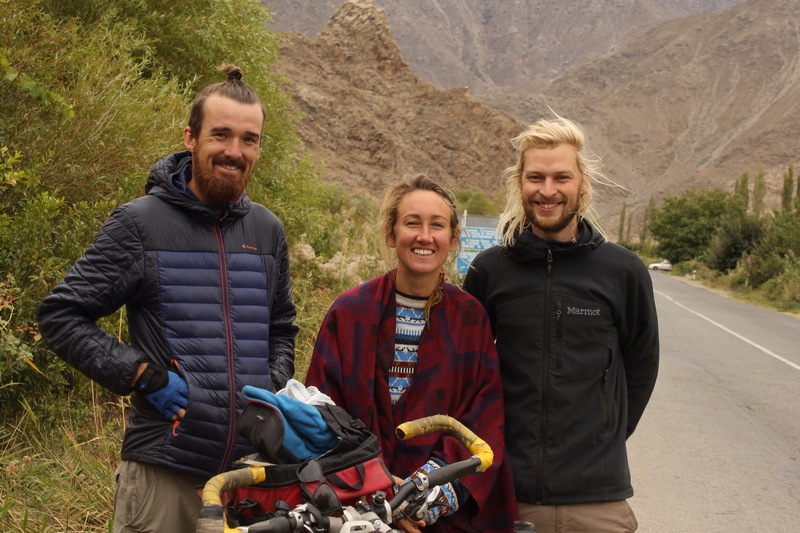 Chris had cycled from Germany, met Sara while couchsurfing in her flat in Greece and four months later they had left home together to continue the journey to India. 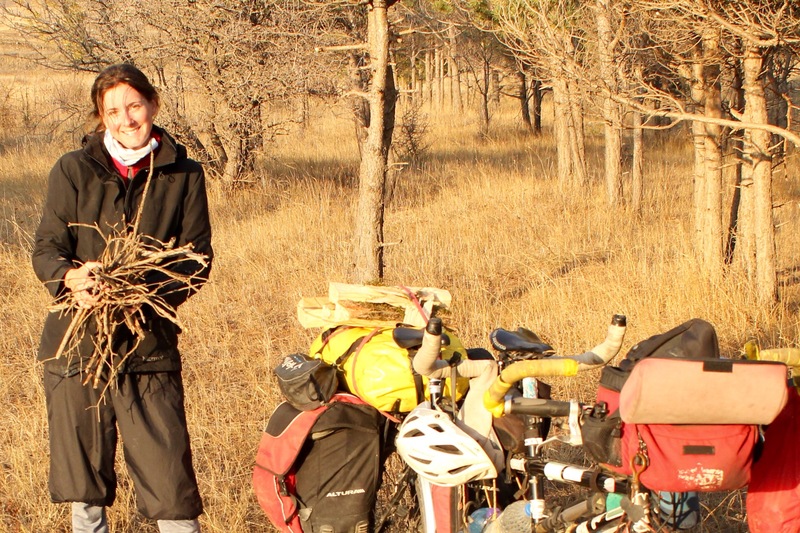 A great tale of cycle touring romance! They were a really lovely couple and we spent a long time chatting on the road side swapping stories. What was more, Chris was kind enough to give us his spare inner tube and more patches!! In return we handed over our map of Iran, the bike shop address in Tabriz where they could get a new tube and my long sleeve tunic which would come in handy for Sara in Iran. We ended our meeting by swapping our Iranian and Armenian SIM cards. 🙂 All in all, a good Silk Road trading session! With Chris’ tube newly fitted we were in good shape to tackle the number of 2000m passes we had ahead but we couldn’t face backtracking down the river again so we decided to take the western route instead. So off we climbed… By 4:30 the rain had started to fall but fortunately just as it was getting torrential we spotted a covered picnic table which would offer some needed cooking shelter and we could just about squeeze the tent under it at one end too. The next morning the sun came out and it was a nice climb through the mountains over the pass with some really great views and more oak forests. The only horrible thing that happened that day was seeing a dog get flattened by a racing Lada car coming down the road. We felt slightly guilty because the dog had been racing across the road to chase us. The dog was BIG and so it was quite a crash. We’ve seen many, many dead dogs on the road but it was quite something seeing one get hit directly in front of us. Anyway, apart from the road kill it was a lovely cycle and with no punctures it was very relaxing despite the stiff gradients. At the top 2530m we stop to layer up and take a quick picture. The descent saw us drop into a deep valley and some very soviet looking towns came into view. 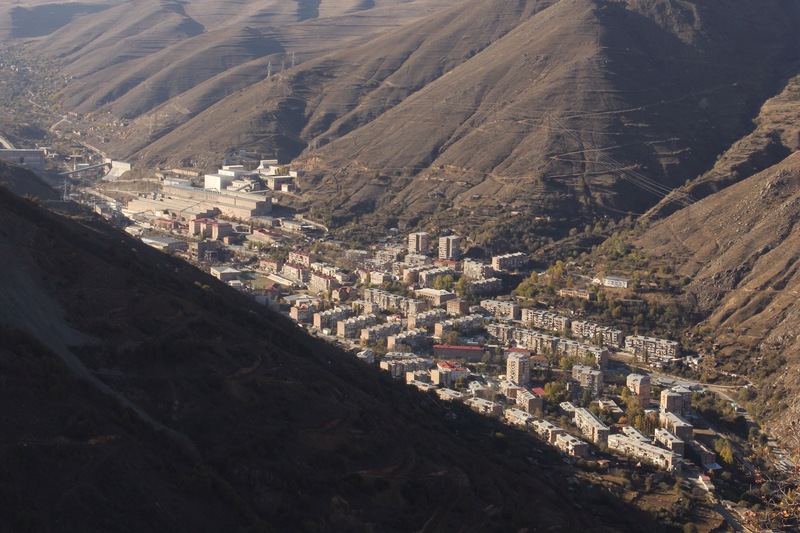 Here is Kapan characterised by stone and concrete high rises and a huge factory. We drop down as far as we can before a thick fog envelops us and push the bike down to a riverside grassy verge. It’s pretty chilly but thankfully there’s plenty of wood scattered about so we get a good fire going before setting up camp. 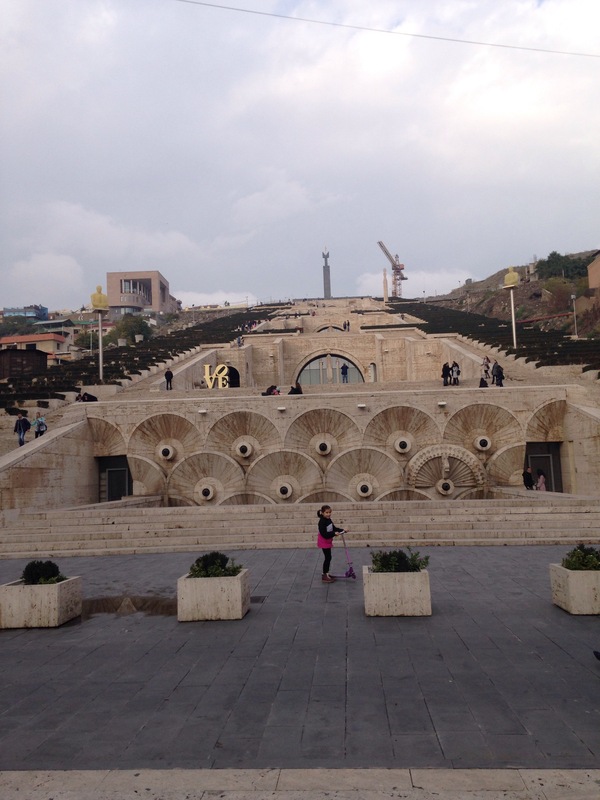 One of the great things about Armenia has been the abundance of water fountains and springs along the roadside. They’re dotted every 10-20km so getting fresh water hasn’t been a problem at all here. The next day we needed to complete another high pass and unfortunately the weather did not improve. Thick fog, drizzle which later turned to rain and cold temperatures… It was pretty miserable! We were both getting very warm and sweaty on the long climbs but soon froze to death on the long downs and our feet and hands stayed frozen for the whole ride. 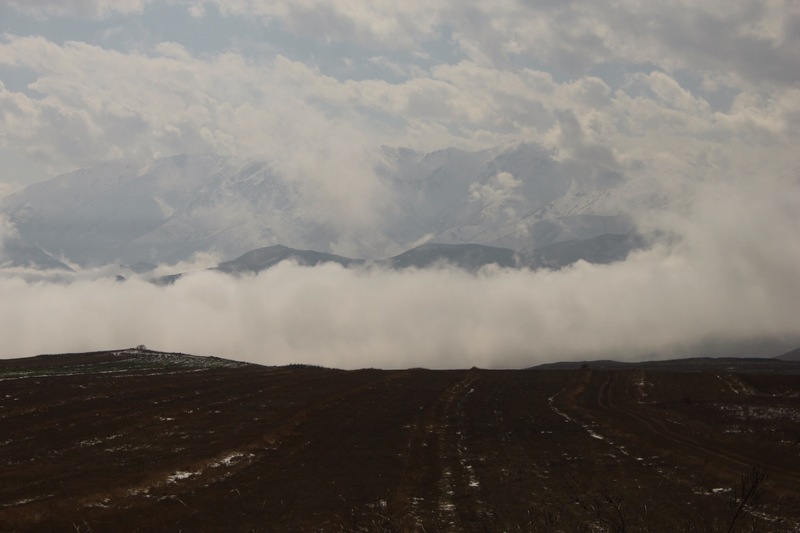 There were snippets of spectacular scenery but the day was mainly characterised by white clouds and fog. We saw enough to know that on a clear day this would have been a pretty spectacular cycle. This didn’t improve our mood! The only thing of interest we saw were lots of areas of woodland taped off with red signs reading ‘DANGER Land Mines DO NOT ENTER’. We were very close to the border with Azerbaijan so these areas probably would have seen fierce fighting during the Nagorno-Karabakh war which only ended in 1994. 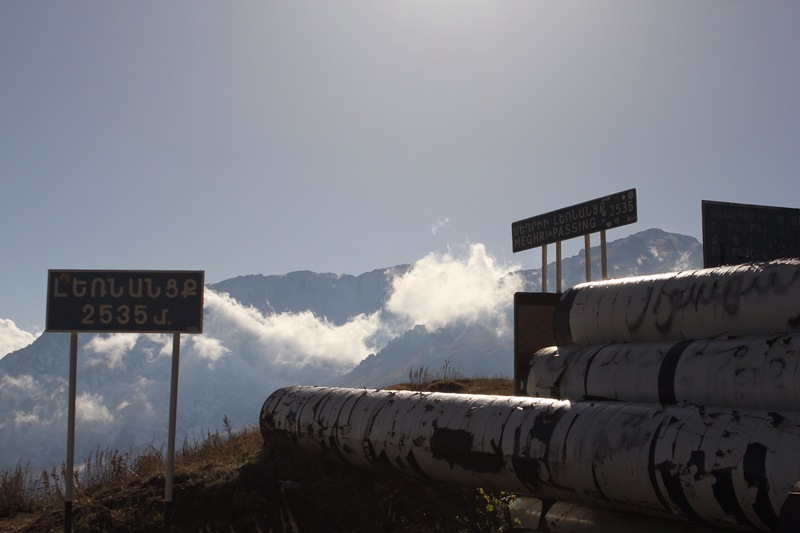 In fact skirmishes and violence have intermittently broken out and earlier this year the worse fighting between the two sides developed into full blown military out with Armenia losing some miles of its territory. 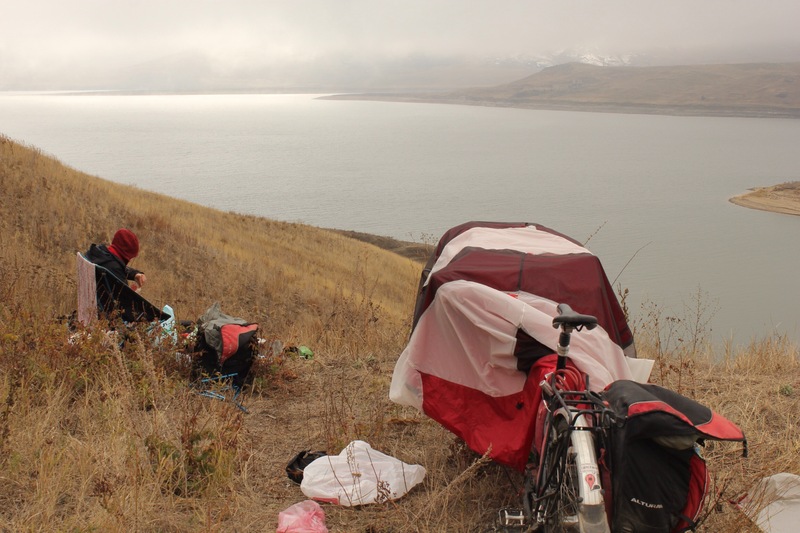 Frozen to our seat posts we free wheeled down to the Vorotan river and knowing that more rain was due that evening we decided to take refuge in a small hotel where we were able to hang everything out to dry overnight.